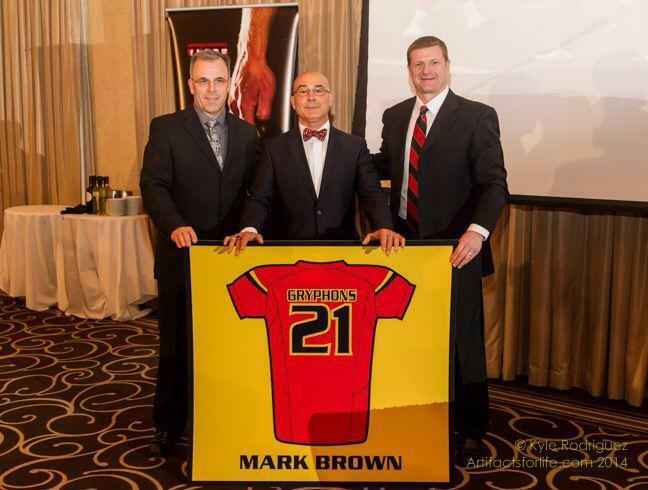 Friends of Gryphon Football, along with a selection committee, are responsible for choosing an Honour Jersey recipient which is revealed annually at the Gryphon Football Gala Dinner. The recipient of the Honour Jersey is a player who dominated the field during their time at the University of Guelph, and was selected by his peers as being one of the most outstanding players to wear a Gryphon jersey. These Honour Jerseys are displayed in the Gryphon Football Performance Centre to inspire current and future Gryphons to become the best of the best. Mike O'Shea played for the Hamilton Tiger-Cats and the Toronto Argonauts and is a Grey Cup Champion as a player and a coach. He was named the CFL Most Outstanding Rookie in 1993, CFL North Division All-Star in 1995, CFL Most Outstanding Canadian in 1999 and he is part of the All-Time Argos Team. As well, he was named the CFL East All-Star 3 times. He was the special teams coordinator for the Argonauts and is currently the head coach of the Winnipeg Blue Bombers. He was inducted into the Gryphon Football Hall of Fame in 2007. He will be inducted into the Canadian Football Hall of Fame this year after having 16 CFL seasons and 271 CFL games as a player. Overall, he proved that the middle linebacker position could be played by a Canadian rather than an import. Sam Benincasa was inducted into the Gryphon Football Hall of Fame in 1991. He was an OUA All-Star from 1980-1984. He was named a CIS All-Canadian and given the President’s Trophy from 1982 until 1984. He was awarded the Wildman Trophy and University of Guelph Male Athlete of the Year in 1983. He was voted into the Gryphons 1980s Team of the Decade. Mark Brown was an OUA All-Star from 1977-79. In 1978, he won the Wildman Trophy, W.F. Mitchell Sportsman of the Year and University of Guelph Athlete of the Year. He was inducted into the Gryphon Football Hall of Fame in 1999. He established 3 school records in 1976 (receiving yards, punting yards, rushing yards) and 1 in 1977 (scoring). Parri Ceci was an OUA All-Star and CIS All-Canadian in 1984-1985. He helped the Gryphons win the 1984 Vanier Cup and won the Vanier Cup MVP award for that year. He was also named the University of Guelph Male Athlete of the Year in 1984 and became part of the Gryphons 1980’s Team of the Decade. He was inducted into the Gryphon Football Hall of Fame in 1994. He has received University Honours for having the most touchdowns in a season, most points scored in a season and most 100 yard receiving games in a year among other Honours. He went on to play for the Calgary Stampeders and his son, Cody Ceci, plays for Ottawa Senators. Steve McKee was an OUA All-Star in 1992 and part of the 1992 Yates Cup-winning team. He went on to play for the Hamilton Tiger-Cats and Ottawa Roughriders. After retiring from football, he has had great success in in the cycling circuit. He remains the Gryphons’ all-time leader in tackles. Mike Hudson was an OUA All-Star and CIS All-Canadian from 1980-1983. He was selected for the Gryphons 1980s Football Team of the Decade. He was inducted into the Gryphon Football Hall of Fame in 1990. He was awarded the 1980 Don Cameron Award for Most Improved Player. He went on to play for the Ottawa Roughriders. After graduating from Guelph, Gerry Organ played as a kicker and punter for the Ottawa Rough Riders in the CFL. He played with the Rough Riders for 12 seasons and helped them win two championships, in 1973 and 1976. Organ played in 176 games in the CFL and is Ottawa's all-time leader in points scored with 1,462 points. He won the CFL's Most Outstanding Canadian Award in 1973 and he is the only kicker to have won this award. He was inducted in the University of Guelph Hall of Fame in 1984 and in 1991, he was inducted into the Ottawa Sports Hall of Fame. Since retirement from football, he has been instrumental in his roles at the Ottawa Athletic Club, the Ottawa Arthritis Society and One Way Ministries in Toronto. Check out the Honour Jerseys mounted in our Performance Center!